This is the first out of 20 confluences that I reached on my bicycle trip along the Great Wall of China. I set off in Běijīng and cycled 4046 km during 35 days. The route roughly follows the 40th degree latitude westward coming through the provinces of Héběi, Inner Mongolia, Shǎnxī, Níngxià, Gānsù, and Qīnghǎi. The mayor part of the trip goes through veld and hot deserts of Inner Mongolia (12 confluence visits) whereas the last week of the trip stands in clear contrast by passing through Qīnghǎi’s Highlands at altitudes between 3000 m and 4000 m. A map ot the biked route can be found here. 12 confluence points had not yet been reported. I also do report 6 incomplete visits that could provide some information for future attempts. The main obstacle was the heat. Around temperatures of 40°C I felt not safe to leave the road for more than 5 km and walk alone into the desert. Note that the density of the road network is low and accessing confluence points in such an environment requires long hikes though no man’s land. On day no.3 of my bike trip from Běijīng I got up at 4:00 a.m. and had some instant sesame cereal in my hotel room. I set off at 4:50 a.m. from Zhāngjiākǒu City (张家口). The early start helped me to get out of town before the rush hour traffic started. Without a major break I rode in north eastern direction. After passing through the village Xīgōuhé (西沟河) I followed road X406 until I reached the village Shízuǐzǐ (石嘴子乡). At a distance of 800 m I turned westwards on a track and abandoned my bicycle at the river at a distance of 350 m from the confluence. The river crossing on foot was easy, because the water level was extremely low. I didn’t even have to take off my shoes. Hopping from stone to stone allowed be to keep my feet dry. The confluence is located on a steep slope on the western side of the river valley. From the flood plain, it is a steep 30 m hike to the exact location. 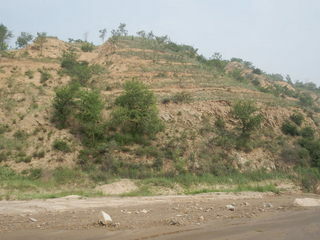 Even though the incline of the terrain is immense, there is a terraced grain field that extends on the area of the confluence point. I continued towards Zhāngběi, but got into a severe thunderstorm with heavy hail on an open field and had to hide in this tube. Time starting the hike: 7:40 a.m.
Time at the CP: 8:00 a.m. Description of the CP: 27 km north-east of Zhāngjiākǒu next to a river of Héběi Province. Terraced agricultural field. Story continues at 42N 114E.